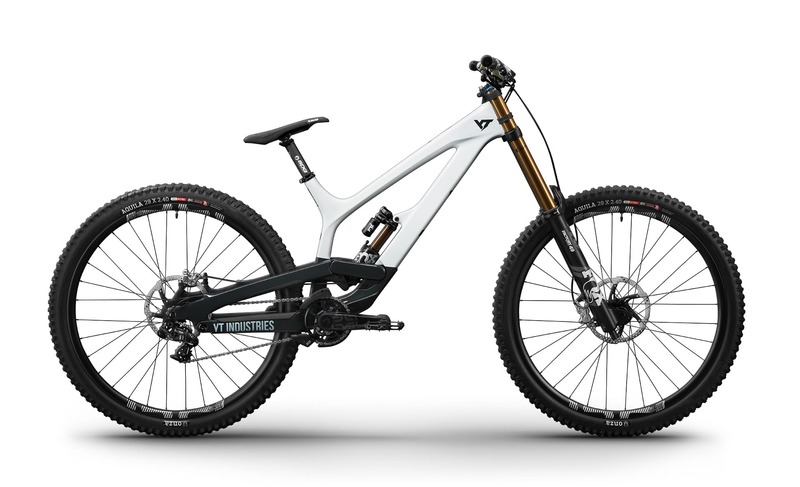 YT Industries released the Tues 29 downhill bike but you have to be 167cm tall and an experienced rider to own one. Although this is the first time that a 29er YT downhill bike has been made available to the public, we already know what it’s capable of thanks to the Mob and the fact that YT rider Angel Suarez will be racing on one in 2019, actually here’s a short edit of the Young Talent ragging his big wheeler for you to enjoy. The 29er version of the Tues will be available in either Race or Pro Race builds, along with the standard 27.5in model. 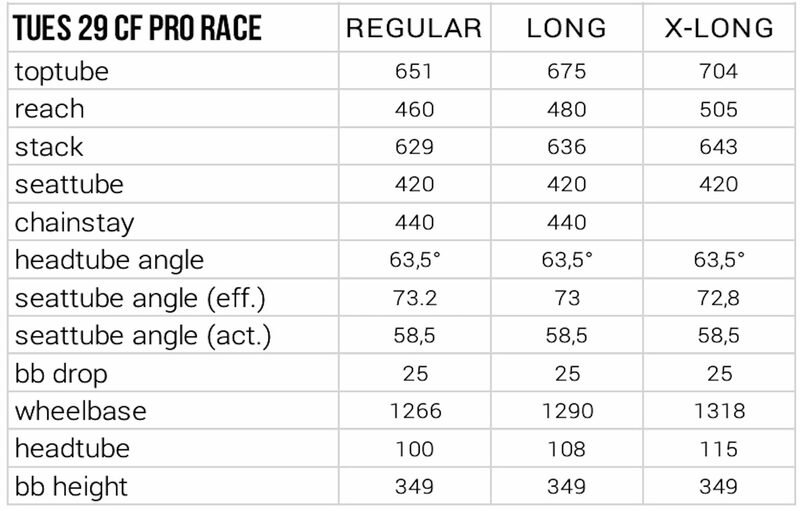 As far as we can tell, both the Race and Pro Race bikes get the same carbon fibre frame and geometry, with the differences being specification based. The CF Pro is the more affordable of the 2 29ers. A CF Pro complete bike will set you back £3,599 and comes built up with a Fox 40 Float Performance Elite fork, Fox Float X2 Performance rear shock, SRAM GX DH rear mech, and a mix of E*Thirteen, Raceface and ODI components. The CF Pro Race is available in Magnesium as seen above and white shown here. 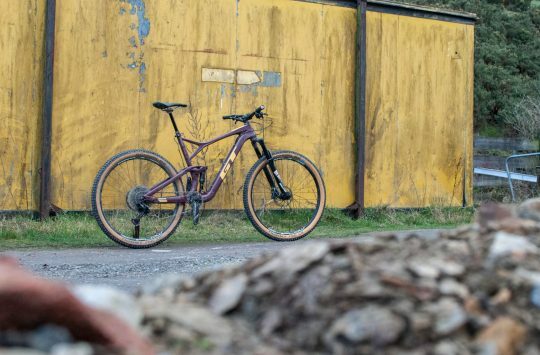 Riders wanting a little more performance can opt for the £4,999 CF Pro Race spec bike which gains Fox Factory suspension front and rear, Renthal bars and stem, SRAM X0 shifter and X01 DH rear mech, E*Thirteen LG1 carbon wheels and a mix of SDG, TRP and Onza kit. 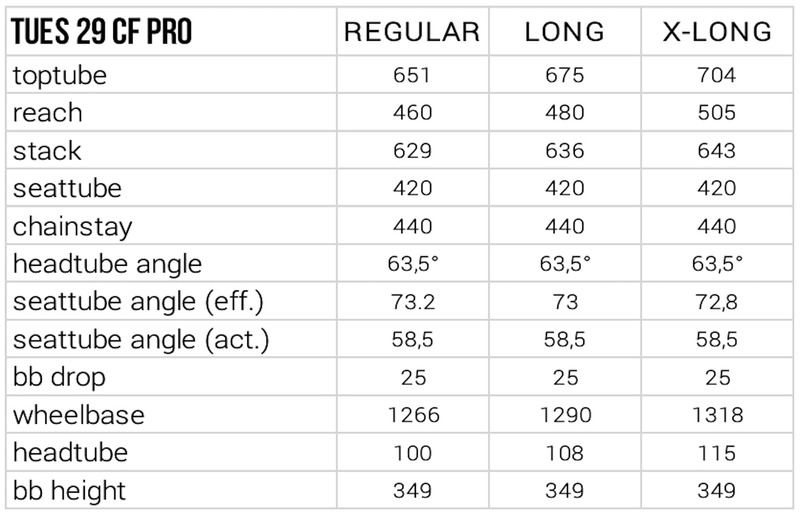 Along with the increase in wheel size the new bikes also receive a generous stretch in the geometry department too, in fact, YT even suggests that riders shorter than 167cm need not apply. On top of that, they also recommend that the new bike is for experienced riders only. If that wasn’t much of a shock, then how about the fact that at the time of writing these new YT Tues downhill bikes are actually listed as in stock! 12. 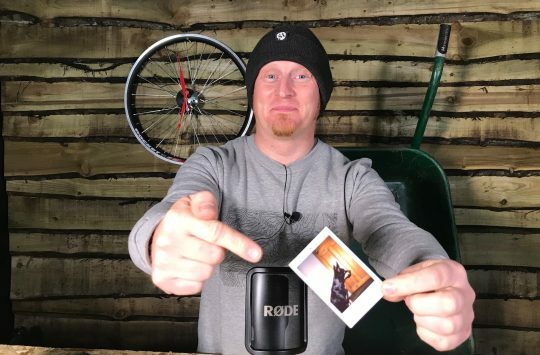 February 2019 – Forchheim, Germany: YT Industries presents the brand new TUES 29. 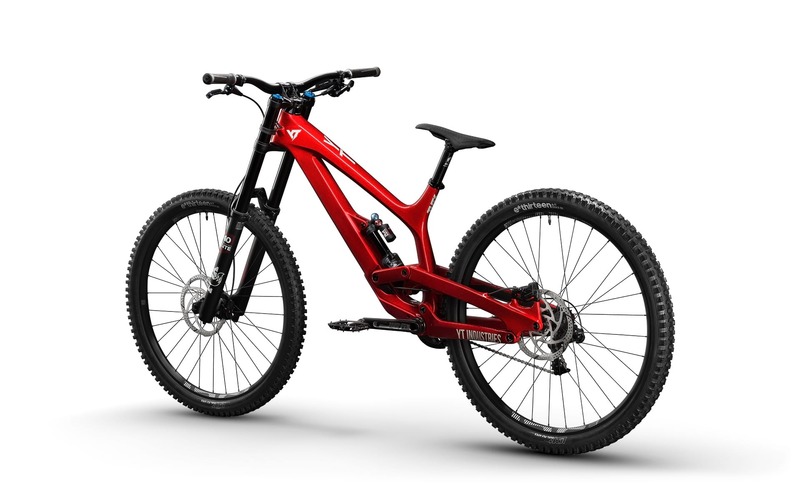 As the fastest bike of the YT range it’s the perfect addition to the downhill category for experienced riders. Two carbon build kits of the TUES 29 are now available in the online shop www.yt-industries.com. For years YT is best known for their downhill bike called TUES. Like no other bike it embodies what YT stands for: gravity DNA. It’s YT’s weapon for racing hard and going big, whether on a World Cup track, in the bike park or at Rampage. YT developed it further in close cooperation with the YT MOB which allowed them to incorporate feedback from the toughest racing series in the world. The result is a bike with racing genes, which mixes incredible control with maximum speed to satisfy even the most demanding of racers. 2019, the time is right for the next big step in downhill evolution: the TUES 29. The TUES 29 is the fastest bike in the YT range. It’s not an all-rounder, it doesn’t compromise, its mission is very specific and made for one particular discipline: downhill racing. We’re talking about the gnarliest downhill tracks in the world, nothing less. That’s why the TUES 29 is the bike that will carry Angel and Vali during the World Cup season. The bigger wheels help the bike keep its composure at full speed, while the kinematics are even a bit more progressive than on the TUES 27. Additionally, the TUES 29 is longer and therefore even more stable than the 27.5” version. 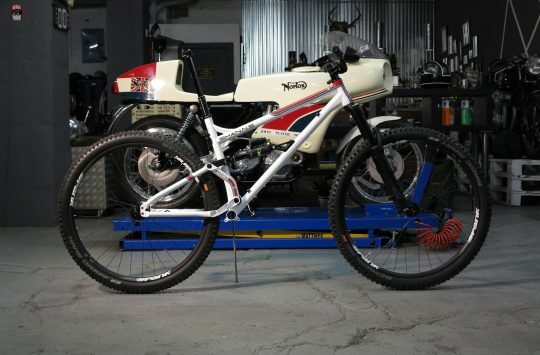 It is one of, if not THE fastest downhill bikes on the market. Therefore, it’s recommended by YT for experienced riders above 167 cm in height, which can chose from three frame sizes: Regular, Long, X Long. The TUES 29 embodies downhill racing in its purest form and is one of the longest 29ers on the market. The geometry was designed to achieve perfect weight distribution and an optimal riding position. YT increased the BB drop to leave you standing deep in the bike. Thanks to a low center of gravity and the frame size-optimized chainstay length you can really push into berms and turns. The slack head angle and long reach keep you on track even at high speed, while the progressive rear linkage always has enough travel in reserve. The TUES 29 puts together everything you need to dominate the roughest and most demanding race tracks this planet has to offer. Big 29er wheels make it even faster and more stable, yet the progressive V4L suspension technology provides a more aggressive attitude. Additionally, V4L gives the bike its incredible grip, helping it stick to the ground like velcro. The frame stands out thanks to its generous reach, exemplary stiffness and low center of gravity and also offers the technical features as the TUES 27 such like double sealed bearings, internal cable routing, single sided hardware access and bolt on downtube protection. Customers can choose between two carbon build kits in two colours each and three frame sizes. The TUES 29 CF Pro Race features a carbon frame and fully adjustable components. With 203 mm of buttersmooth Kashima travel and EVOL airspring technology, the FOX 40 Factory fork and FOX Float X2 Factory shock are the perfect combination for demanding, high-speed descents. Both the fork and the shock provide 4-way high and low speed compression and rebound adjustments as well as air spring pressure to make sure one can set them up according to their preferences. E*thirteen’s cassette provides 233 % of range and weighs in at just 180 grams, while SRAM’s X01 DH 7-speed derailleur ensures direct and accurate shifting in any terrain. TRP‘s G-SPEC DH brakes are among the strongest on the market, and will stop the TUES on a dime, every time. The Renthal cockpit together with the carbon wheels and cranks from e*thirteen keep the weight down and the reliability high – just what you would expect from a pure-bred racing machine. The TUES 29 CF Pro model features a full-carbon frame and the FOX 40 Float Performance Elite fork and FOX Float X2 Performance Elite shock with 203 mm of travel – the perfect combination for rough trails and high-speed descending. These suspension components lack the Kashima coating but offer the same performance as their Factory brethren. The reason for this is that both versions use similar damping cartridges, which ensures excellent response and plenty of mid-travel support. The suspension provides adjustable low-speed compression and rebound damping to make sure it can be adapted to any terrain and riding situation. Weighing in at just 180 grams and offering 233 % of range, the e*thirteen cassette is the perfect base for the drive train, with SRAM’s GX DH derailleur and shifter ensuring fast and precise gear changes. TRP’s G-SPEC Quadiem brakes are some of the most powerful stoppers on the market, while e*thirteen’s lightweight yet robust LG1+ DH crank and LG1+ wheels round out the TUES 29 CF Pro build in style. 27.5” or 29” wheels: both TUES versions are fast, aggressive, and oh so capable. Which of these downhill monsters you choose depends on how and where you ride. If winning downhill races is all that counts for you, the TUES 29 is just the bike you need. It combines the speed and stability of the big 29“ wheels with the hardiness of a downhill frame, that’s why YT recommends the TUES 29 experienced rider above 167 cm in height. They can chose between three frame sizes ranging from Regular to XLong. If you are looking for a more versatile bike and you also like to ride a lot of bike park, the TUES 27 is the better choice. Thanks to the dynamic handling and the smaller wheels the TUES 27 is a versatile bike for all riders from S to XXL who want to get their hands on an all-rounder in the downhill category. Find more information about the new TUES 29 on www.yt-industries.com. umm 167 is 5ft 5 3/4. Is that tall?